I am trying to implement form based authentication (FBA) membership provider that is able to support multiple authentication mechanisms. Take it as an self-training experiment. In this posting I will introduce bases of my experiment and introduce my current plans and ideas. I am looking at features of different versions of Visual Studio and I less and less understand how and why is the quality of software handled as fun of few seasoned professionals. Although Visual Studio is best development platform I have ever seen I really don’t understand why Microsoft hates people who want to provide quality to their customers. 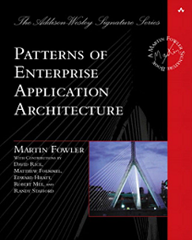 Lately I finished reading the famous patterns book by Martin Fowler - Patterns of Enterprise Application Architecture. This book introduces and describes design patterns you will usually see when building enterprise applications. There are also examples for patterns and although they are simple and primitive they give you the idea how to implement or use specific patterns. If you are working on enterprise applications every day you will find this book very useful and I’m sure you will use it as manual. Yes, you can read this book as any other book and you can also use it as manual. In the end of this review you can find table of patterns with links to short introduction for each pattern. Today I worked out simple application side object locking solution for one server scenario. My motivation came from ASP.NET architecture forum thread How to solve concurrent site issue where one user asks for locking solution that works without changing database. Here is my simple and primitive solution that should help this guy out. I added also sample solution to this posting. Today I tried out ASP.NET MVC HTML5 Helpers Toolkit by Dean Hume. Although browsers today support HTML5 partially it is time to start playing with it. As soon as HTML5 gets common standard in web you should be able to react fast. In this posting I will introduce you HTML5 Helpers Toolkit and some HTML5 field types. Lately I blogged about HttpNotFoundResult and HttpStatusCodeResult action results that come with ASP.NET MVC 3. These results are ideal for controller tests as we don’t have to mess with HttpContext and Response objects anymore. In this posting I will show you how to use HttpNotFoundResult in controller tests to check if errors are given correctly to user. ASP.NET MVC 3 brings us new view engine called Razor. Razor view engine was made available with WebMatrix first beta. Razor brings us new and very short syntax for writing views. In this posting I will introduce you shortly ASP.NET MVC Razor view engine. Today I played with WF 4.0 declarative workflows. This posting shows you simple workflow that you can extend to add songs to online radio station queue. My main focus here is workflow and I will provide here no logic for actual queue implementation. You can find here also Visual Studio 2010 sample solution. 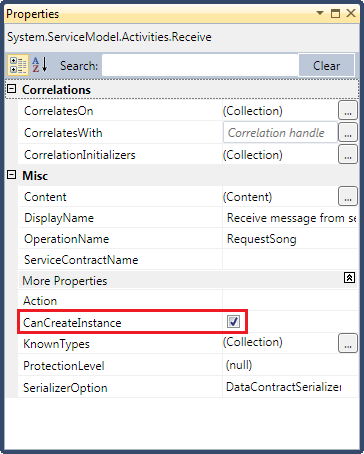 There is no context attached to the incoming message for the service and the current operation is not marked with "CanCreateInstance = true"
I got this error when testing my example WF 4.0 workflow that runs on WCF. To get over this error just open your workflow, select Receive activity and make check to checkbox called CanCreateInstance (click on image at right to see it at original size).